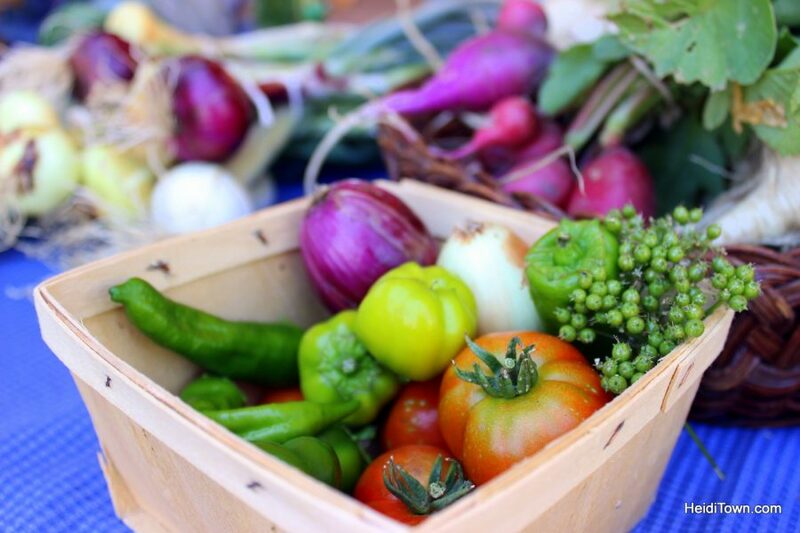 Farm to Fiddle Summer Festival encompasses everything a summer festival should be; there’s fresh veggies, singing and dancing, chickens, a climbing wall, locally made beverages and so much more. All of these things are why I love Hotchkiss and the entire North Fork Valley, an area that is located about an hour southeast of Grand Junction and four and a half hours from Denver via McClure Pass. I’ve called the North Fork Valley the land of milk and honey, and it’s literally where the Rocky Mountains merge with the mesas and this means an excellent growing climate and unsurpassed beauty. It’s also a fantastic spot for those of us who love furry animals, fresh fruit and local wine, and Farm to Fiddle Summer Festival has it all. Veggies at the Hotchkiss Saturday Farmers’ Market. Taking place over the second weekend of August, Farm to Fiddle starts on Friday at noon to the beat of David Alderdice & the Community Band. Alderdice is a local rhythmist and founder of Embodying Rhythm School of Percussive Arts in Hotchkiss. Farm to Fiddle is one part community party and two parts a showcase of what this community brings to the world. 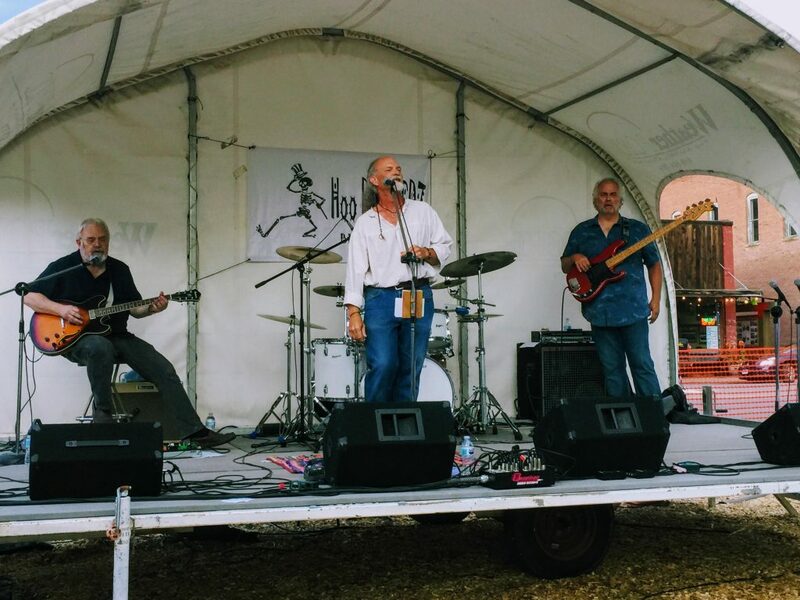 The fact is that the North Fork Valley has attracted many musicians over the years and they are passionate. This festival is their way to share this passion with the community and visitors. 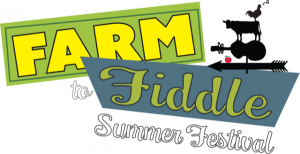 Music plays a big role at Farm to Fiddle Summer Festival. Photo provided by the festival. 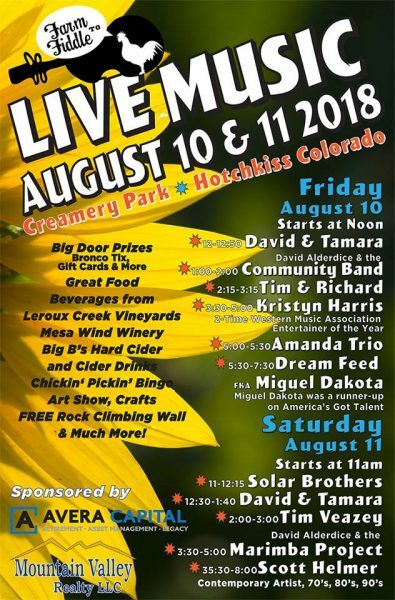 Music plays a big role in this event that features Colorado talent like Miguel Dakota, a runner-up on America’s Got Talent who hails from Monument. Dakota headlines the event on Friday night. The event’s music calendar continues on Saturday and ends with Scott Helmer from 5:30 to 8 p.m. This festival isn’t only about music. In addition, guest can take part in Chicken Pickin’ Bingo, an activity that HeidiTown is sponsoring. There’s delicious food to eat or purchase for later from the farmers in attendance, and plenty to drink from local wine cider producer that I love such as Leroux Creek Winery and Big B’s. 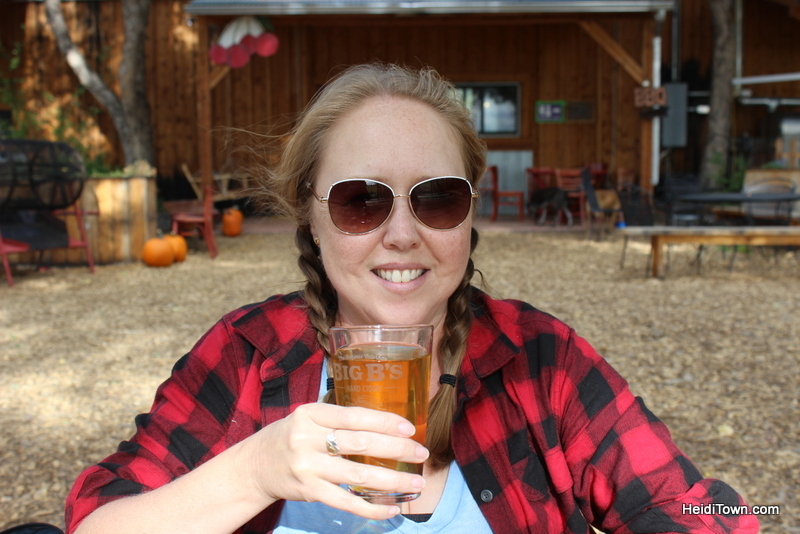 Enjoying a Big B’s cider at Delicious Orchards in Hotchkiss, Colorado. Art plays a major role in the life of Hotchkiss. Creamery Arts Center in the middle of Hotchkiss’ downtown is one of the best places to visit in the area and I believe it’s the real heartbeat of the arts community here. 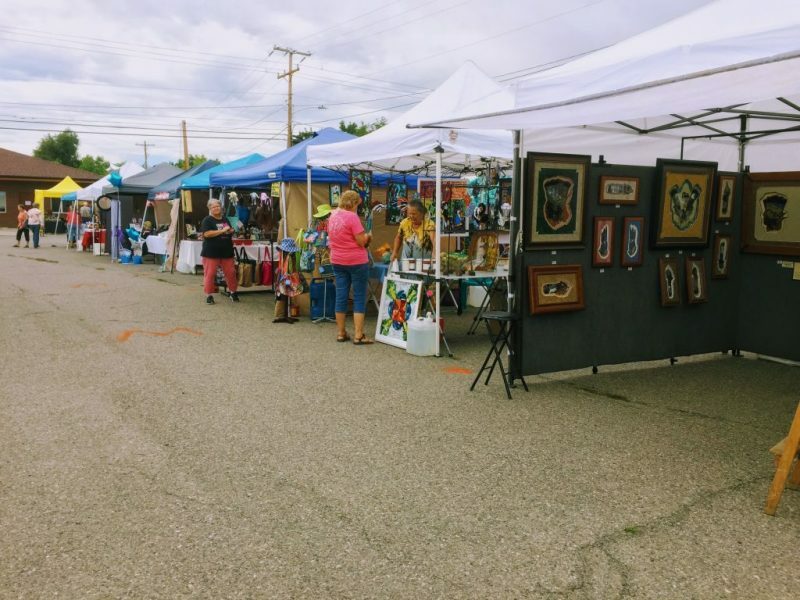 The art show during Farm to Fiddle Festival will be a big draw to the event, and it should be as many incredible artists call this area home. Come prepared to buy something for your home. Photo courtesy of the festival. 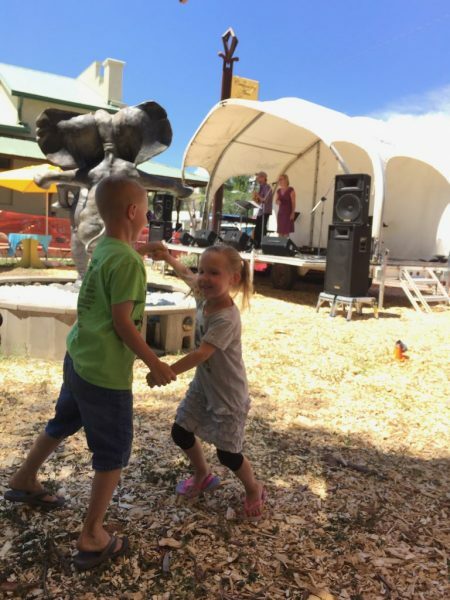 Be sure to bring the kids to Farm to Fiddle Summer Festival because there is a lot here for them to enjoy including a climbing wall, but beware, they just might want to dance the day away. New this year, Farm to Fiddle is featuring some big giveaways such as tickets to a Denver Broncos game, and no one wants to miss that giveaway. I’m excited to be part of this event, so please join me in the North Fork Valley this August. Is there a schedule of events somewhere? Like when is Chicken Bingo? I believe there’s only a schedule of music so far. I’ll update this if/when I find out Chicken Bingo timing!